Tami Fincher dives into projects head first. Two years into a 5-year plan to retire early in Central America, her short list – so far – is Boca Chica and El Valle de Antón, in Panama, and Guanacaste Province, in northern Costa Rica. She and husband Stephen Fincher are making their plans to join the growing number of Americans-turned-expatriate retirees. In 2016, more than 603,200 Social Security checks were mailed to retirees, their spouses and widows living abroad. They are moving as much for the adventure as for the lower cost many countries offer. 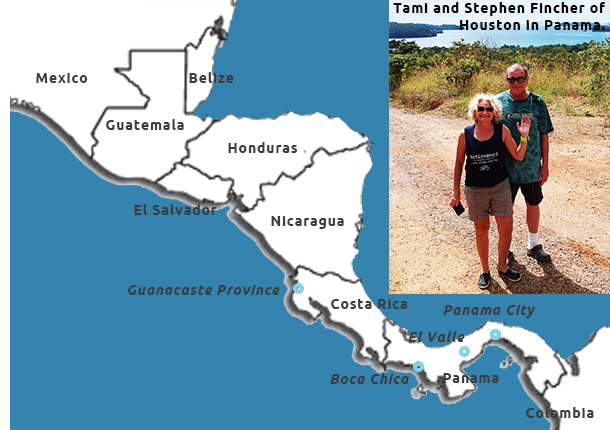 To assess the pros and cons of Costa Rica vs. Panama, the Finchers made their first exploratory trips, to Costa Rica last June for their 20th anniversary and to Panama over the New Year’s holiday. If Tami, age 53, has her way, they’ll retire in about three years and sell their Houston home to relocate. Steve, 57, would like to work at least one year after that. He’s a dog person, so much so that he got a job 13 years ago selling invisible electronic fences to keep dogs from wandering away from home. He feels this is important work and wants to keep doing it. But it’s okay, too, if they move to Panama or Costa Rica and things don’t work out. They’ll try another country – why not Ecuador? Once they leave the United States, “we’re going to be gone,” Steve said, as will their Labradoodle, Labrador-Pit Bull mix, and Black-mouth curs. While money is not their sole motivation, a much lower cost of living abroad will facilitate their early retirement. Experts generally encourage baby boomers to work as long as possible to put themselves in the best financial position in retirement. She has a traditional pension, and together they’ve saved “more than the average American” in their 401(k)s and IRAs, she said. “We didn’t have kids or college or cars to buy.” They’re being smart about Social Security and will delay filing for their benefits until they’re at least 68. Claiming benefits at 70, rather than 62, increases the size of monthly Social Security checks by 75 percent. Tami’s research indicates they can buy health insurance for $80 a month in Costa Rica. In Panama, paying for medical care out-of-pocket would be cheaper than, for example, staying in Texas and signing up for post-employment COBRA health benefits for the 18 months allowed under federal laws. The Fincher’s bottom line: lower expenses mean more fun. Steve expects to “drastically” cut their spending by relocating, without sacrificing a comfortable lifestyle. He likes to fish and belongs to a shooting club, activities he’ll continue overseas. Tami enjoys off-road cycling, and they both hike and want to “hop around to Ecuador or Columbia or Peru,” she said. Steve does worry about getting bored in such small towns, after 18 years in Houston. While they are planning to stay abroad for the long term, they’ve agreed to come back together if either doesn’t like living overseas. On their trip to Panama, they learned that the fishing village of Boca Chica is “nature’s haven. Beautiful, water, the scenery, the green,” Tami said. El Valle, nestled in the mountains, is cool though not cold. It’s also a larger town with amenities like coffee and bicycle shops and a two-hour drive to Panama City. Panama is “completely different” from Costa Rica, she said. Whatever country they choose the Finchers view living abroad as their own version of paradise. All the best to ex pats. Best to live in the location of your choice for at least a year before saying goodbye to Uncle Sam. There is another consideration…there is no way for people in their 50s or even 60s to anticipate all the health problems they can encounter as years go on. Even if they feel medical care is good and cost is lower, the support of friends and family is beyond measure. Interesting to note that Canada has the highest number of ex pats. They are certainly not going there to save on living expenses. This is very interesting and I have never given it much thought. But alas I am no longer at an age to entertain the idea! Interesting. I did not think that Social Security put any checks in the mail anymore, not even within the U.S. They had to be electronically deposited into a bank. And they would not deposit them into a foreign bank outside of the U.S. I was under the impression that you would have to have your check deposited into a U.S. bank and then have that bank transfer the funds to a foreign bank. This is news to me. I am on Social Security and the only option I had was an electronic deposit. This is definitely on our radar. We’ve been studying the idea for the last 5 years and we’ve traveled to France, Germany, England and Ireland, but Central America may fit the bill a little better. I retire next month so the plans are ramping up. It’s an exciting time of life! My wife and I have lived in Spain and Scotland. We liked Scotland better for some things and Spain for others. I didn’t think it was cheap nor economical. We lived well in both but live well here in Tennessee on our mountain top. Medical and dental are better in the USA and hospitals (not saying others are better) are just better and when you get old you are sure to need a doctor or nurse. I cannot state that you’d like life everywhere else (and as a retired federal law enforcement officer, I’ve lived in about 10 places in the U.S.: north, south, east, and west) but U.S. healthcare is NOT the best by a long shot, and more expensive than anywhere on this planet. How about Nicaragua. It is up and coming. It has come a long way in the last 10-15 years. People are nice, happy, easy connections to the States, and there is affordable health care. I have my sight on it for when the time comes. Read my comment below. Nicaragua sounds great, although we’ve only spent a short time there. Also Costa Rica is far more first worldish, but also more expensive. Maybe we’ll see you in Nicaragua? Don’t forget, if it doesn’t work out (give it some time! ), you can always return. I’d rather die in a place that I like, than live for years in a dreary environment that is boring. For some folks, including us, retirement to a third world country has been great, and although we returned to the U.S. for a couple years now for my wife’s school, we’ll be heading back soon. We lived in a several countries for at least 6 months, Thailand (being the longest at 4 years), and also Cambodia, Ecuador, and Belize, and soon Nicaragua. In addition, we’ve traveled in 15 other Central/South American and Asian countries for around 4 years, so we’ve seen some of the good and the bad. None were truly dangerous, only too annoying. When someone says that a third world country is dangerous, I’d take that with a huge grain of salt, as it’s unlikely they’ve even been there. In our years in these countries the WORST that has happened is someone stole our rain jackets (Ecuador, and probably a foreigner) and they stole our lunches from a rented motor bike. See for yourself, and DON’T listen to know-it-all folks, as they often DON’T! U.S. medicine seems focused on treating the symptoms rather than the CAUSE of the symptoms. My husband and I have also considered life abroad. We are interested in the islands after our first cruise two years ago. We are in the planning stages to do our first move in about 10 yrs or so. We’re still pretty young in our career fields and have a ways to go before retirement. Most of us have direct deposit. Get a bank that doesn’t kill you with ATM and foreign transaction fees. We recently took early retirement from the US Government and moved to Australia. I was fortunate to receive a scholarship to pursue my PhD. Between our retirement, scholarship, and veteran’s benefits, we’re living the good life in Oz. The weather here is incredible, the people are fantastically friendly, and the scenery is wonderful. We took the minimalist route for our new life and it significantly changed our lifestyle and increased our happiness. There are also some tax advantages to being an ex pat abroad that folks should consider when the relocate. Good on you for your decision and congratulations! In Europe, Spain is a popular country to retire. The region around Benidorm / Calpe is great! The weather is almost always sunny. What about buying land? If I were to move abroad, I’d want to buy a house instead of renting. I know Europeans have it easier as they can buy property in other EU nations without citizenship, but US citizens have other hoops to jump through. Any thoughts? We’ve spent several years in third world countries, and always rented because there is so much to see in new places. The most we’ve spent per day on rentals is about $20, sometimes much less if it’s 1 month or more. $5 rental amounts are not unheard of, even now, in some areas. Renting gives us peace of mind and flexibility without concerns about the land. Be careful; many horror stories. We have 5 friend couples who have moved back to the states. You get what you pay for and that is most definitely the case is safety and cleanliness. Many drawbacks now with the uprisings. Venezuela was considered great, now their people are fleeing the communist nation due to starvation and the money in their banks is gone. Many reasonable places in the US that are equal to 3rd world countries. Be careful. Sounds like the boogie-man is coming. Jeez, who in their right mind would think that going to Venezuela was a good idea? Really? You have to look at the government and politics as well as the living situation. Most Americans think the rest of the world is there to serve them. Wrong! We’re guests in their country and should act like it. Our place is going to be Mexico and we couldn’t be happier. 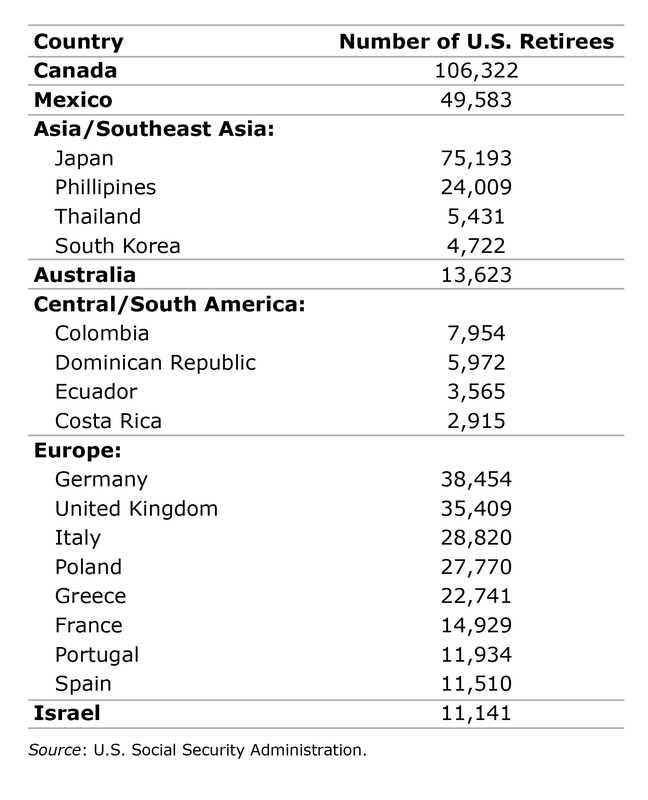 If other retirees want to stay in the US, then fine. More paradise for the rest of us. I love this piece because it describes what I have been up to. In 2011, I sold everything I owned, took early retirement and began traveling the world. My idea is to base in different places, immerse myself in the culture and explore. So far I have lived in Mexico, Thailand, Cambodia, Laos and now I am living in Portugal. I am loving the new lifestyle and plan to continue this method of seeing the world for many years to come.